Start your Thanksgiving with fun and fitness. It’s the 4th Annual, Unofficial 5K Turkey Trot Thursday, November 22nd at 8am! 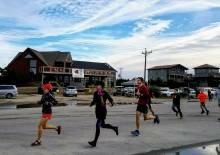 Presented by Angie's Gym and 1718 Brewing on Ocracoke. 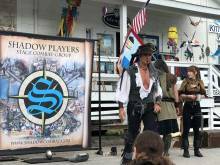 This year’s Ocracoke’s Pirate Jamboree marks the 300th anniversary of Blackbeard’s beheading. The event this year will span four days, starting Thursday evening and ending Sunday at lunch. Enjoy Folk Music on Ocracoke Island. In 2018, the Ocrafolk Festival celebrated 19 years of Music, Storytelling, Fine Art, Crafts and Dance. 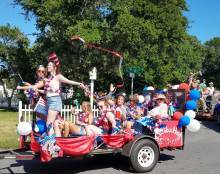 Read our recap of this special Ocracoke Island Festival. 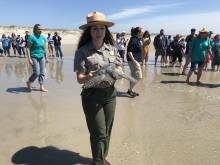 On a sunny spring day on Ocracoke Island a crowd gathered at the Lifeguard Beach to cheer on twelve sea turtles that were released and returned to the ocean.